The Washington Post has published a sharp rebuke to former Labor Secretary and current U.C. 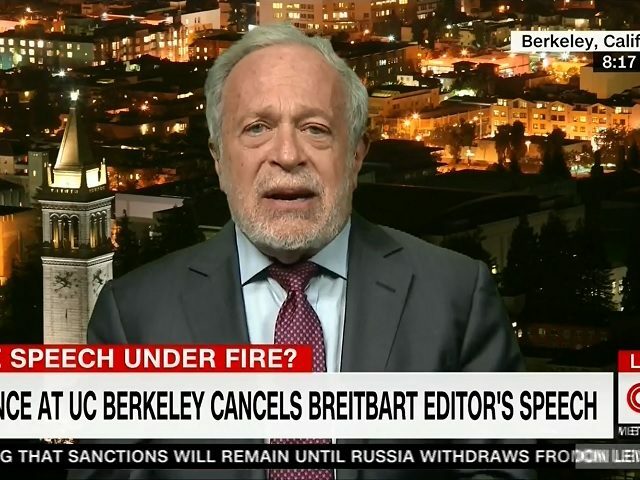 Berkeley professor Robert Reich’s wacky claim that violent left-wing protests at Berkeley last week were somehow the result of a plot by Breitbart News. So let’s see: Yiannopoulos, who is an outsider to Berkeley and generally unwelcome there, succeeds in secretly arranging for more than 100 thugs to assemble in this city and then invade the Berkeley campus and cause more than $100,000 in damage, all to create a pretextual motive for Trump to alter federal funding for the UC system. And Yiannopoulos manages to do this without a single one of the thugs spilling the beans and tipping off the fact that this violent criminal conspiracy is organized by Yiannopoulos, not his opponents. To even describe the plot is to make clear how phantasmagorical the whole idea is. Occam’s razor applies here. Or, as medical students are taught, when you hear hoofbeats, think horses not zebras. There is no way Yiannopoulos organized these protests, subjecting himself to serious criminal liability and placing the fate of his career on the sealed lips of more than 100 conspirators. Instead, the simplest explanation is the correct one: The persons responsible are left-wing anarchists, as the New York Times (among others) has described in this recent article. The only thing that remains strange about the events last week is the fact that Berkeley police have proved so inept. While the police were praised for their “restraint” during the riots (and perhaps that praise was justified — I venture no opinion on riot-control tactics), they have been unable to now identify even a single one of these criminals.